I love making galettes. Simple to prepare and impressive to guests. You can fill it with whatever fruit is in season. 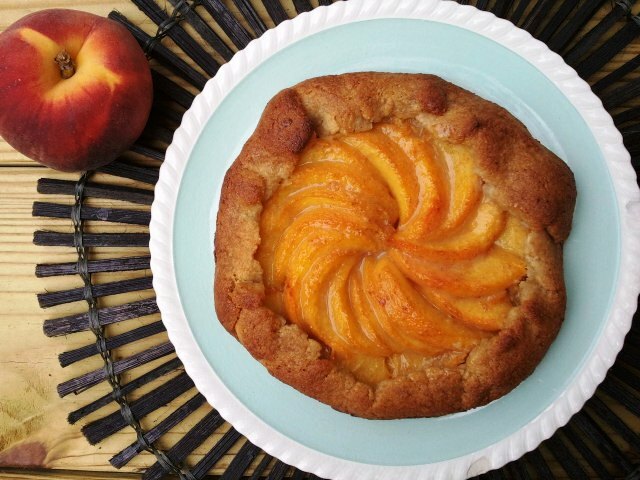 Right now peaches are so ripe and sweet, making it the perfect fruit for this gluten free galette. Make these ahead of time and serve with cinnamon whipped cream or vanilla ice cream. This recipe here is for making 4 mini galettes, or one large galette with the dough. Just skip the step of quartering the dough. This crust is buttery, flaky and crispy all at the same time. Be sure to use ripe peaches for best results! No one would ever guess that this dessert is gluten free, grain free and even healthy! Stir together melted butter and honey. Add egg white. Add remaining dough ingredients. Stir well to combine. Shape dough into a round disk and cut into 4 wedges. Shape each into rounds, flatten, cover and refrigerate. Bring a large pot of water to a boil. Gently drop in peaches, boil for 1 minute and shock in a bowl of ice water. The skin should remove very easily right away by peeling back with a knife. Preheat your oven to 325 and begin to assemble your galettes. Slice your peaches thinly. Toss them with the cinnamon and coconut flour. Set aside. Decoratively arrange your peaches on each round, leaving a 1 inch border. With a small offset spatula fold up edges over the peach filling. This dough is very forgiving, don’t worry if it cracks, just push it back together. Stir together the egg yolk and honey and brush around the edges of your dough. This will make for a nice golden crust. Bake at 325 for 25-30 minutes until golden brown. Remove the galettes from the pan and place them on a cooling rack. Glaze the peaches with the honey/butter mixture. Allow galettes to cool and serve at room temperature. When I saw this post, I almost wanted to cry! Galettes were one of my favorite summer treats prior to going gluten-free. I thought I would never be able to make a dough that would stand up to it, yet here it is! Thank you so much for doing the hard work of figuring the recipes so that those of us who L-O-V-E to bake can do so freely! can i substitute the butter in the dough with coconut oil? This looks beautiful! I’m curious about the result – does having egg in the dough itself make a big difference in crust texture? I also notice the butter is melted instead of cut into the dough, how does this affect it?